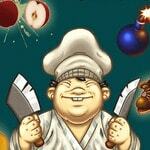 Fruit Chef it is executed in stylistics of an original fruit ninjia. We should cut sharp клинком fruit in considerable quantities. Having earned enough of money it is possible to get new cold steels.